“Oh, I just don’t know where to begin,” laments a young Elvis Costello in the opening line of “Accidents Will Happen”, the first song on 1979’s Armed Forces. Nearly 40 years later, newcomers to the songwriter’s daunting catalog might feel the same. Costello falls into a strange category of rock star. If his name doesn’t quite ring familiar, then his iconic Buddy Holly spectacles and faithful pork pie hat usually peg him. In addition to putting out 30 studio albums and touring rigorously, he’s filled in for Letterman, hosted his own television show (Spectacle), cameoed in several films, been inducted into the Rock and Roll Hall of Fame, and even performed at the White House. And yet, your average American walking down the street — even the Alisons and Veronicas — probably can’t name a song by him. Ironically, Elvis Costello is more or less a household name (and face), but his music can’t claim that same ubiquity. For those familiar with Costello’s work – including legends or collaborators like Bob Dylan, Paul McCartney, T Bone Burnett, and Burt Bacharach – one of the great mysteries remains how more people don’t know his catalog by heart, especially his inspired, out-of-the-gate string of biting records with producer Nick Lowe and eventually The Attractions. 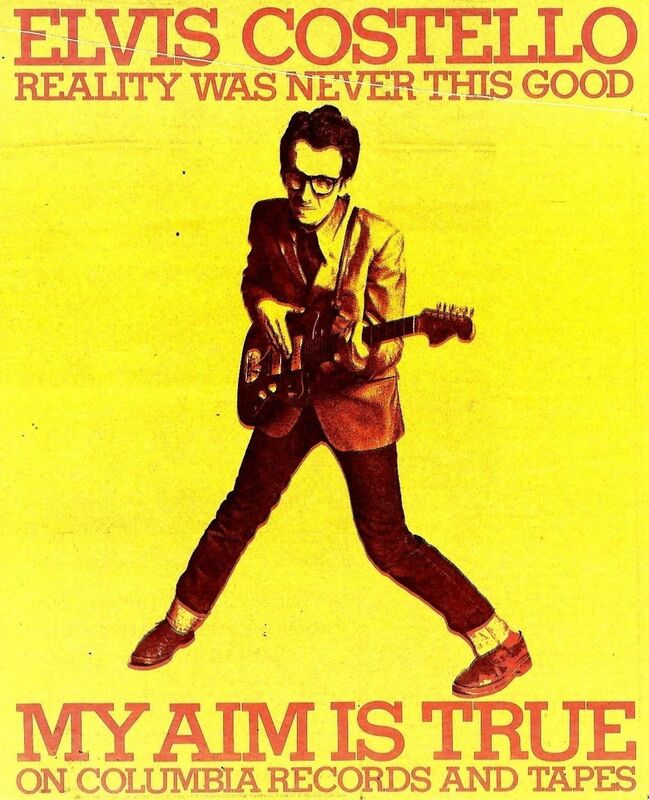 Forty years ago this weekend, Costello released arguably the greatest debut in rock and roll history, My Aim Is True. Already a young father and husband, Costello’s recording process consisted of writing songs late at night sotto voce (as to not wake his family) and calling in sick from his job as a computer jockey processing invoices next door to a lipstick factory so that he could record. Six four-hour sessions and a new, more regal name later and Elvis Costello as we know him from that iconic album cover was born.